Petoholics Anonymous / Big News!!! It doesn’t look like much, does it? Just Niqora and Grakoth doing some quests in Shadowmoon Valley. But oh, it is much more than that. The text box hints at it. Whether you want to believe your eyes or not, it’s true. Niqora has reached level 70. 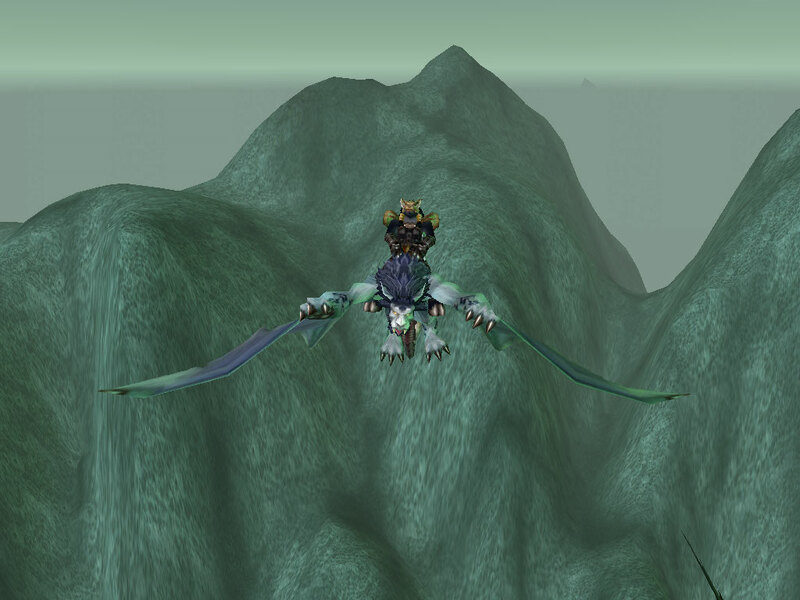 The absolute first thing I did after reaching 70 was mount up and race back to Shadowmoon Village. I had saved up over 2000 gold so I sauntered over to Dama Wildmane. My favorite troll hunter joined me and helped me pick out this beauty. He then took me for a tour, showing me the Skyguard and Shattered Sun dailies. I knew flying would be fun but I was having a blast! He laughed when I kept saying “Wheeeeeeee!” while flying around in circles. He was really nice of him to take the time to show me around, even if I was half dead from playing for 12 hours straight. The reason why I had been playing for 12 hours? Well, I wanted to get to 70 that day but also because Mr. High-And-Mighty Paladin said I couldn’t do it, not enough time. I was determined to prove him wrong and I did. So that’s the big news! Aren’t you all so excited for me?! Ah, I know that as happy as I am about it, most of the people reading were hoping for something else. I don’t want to disappoint you…go on and read the next post. Comments closed — Trackbacks closed RSS 2.0 feed for these comments This entry (permalink) was posted on Tuesday, August 12, 2008, at 1:26 am by Faeldray. Filed in Friends and tagged Niqora. Congratulations Faeldray! Can’t you just about feel the wind blowing through fur as she flies through the skies? It’s the closest many of us will get to knowing what it feels like to be a bird.